How robust is William Ruto’s plan to succeed Uhuru Kenyatta in 2022? President Uhuru Kenyatta is yet to name his full second term cabinet, 52 days since being sworn in for his second term. According to news reports, the delay might be due to internal wrangles within the Jubilee Party over specific cabinet appointments. While Kenyatta is keen on putting together a cabinet that will help him implement his ambitious legacy projects, Deputy President William Ruto wants a cabinet that keeps the path clear for his stab at the presidency in 2022 when Kenyatta will be term limited. It seems, at least for now, that the two goals are in conflict. Formed ahead of the 2017 election, the Jubilee Party was supposed to be a commitment device binding Kenyatta and his supporters to Ruto’s planned bid for the presidency in 2022. The idea was to make the party strong enough at the grassroots to make it impossible for anyone to run and win without pledging loyalty to the party leaders — Kenyatta and Ruto. Not all of Kenyatta’s elite supporters are on board with this plan. Kenyatta needs Ruto for the rest of his presidency: Ruto cannot be fired (see the Kenyan constitution). His legislative point man, Aden Duale, is the Majority Leader in the National Assembly. And he has enough votes in the legislature to control the agenda (mainly through veto threats), and to frustrate Kenyatta should the two fall out. That means that even if Ruto loses the fight over specific cabinet appointments, he would likely get a substantial side payment that leaves him financially potent ahead of 2022. Furthermore, while he may not be able to sway every single voter in his core base, there is no reason to believe that Kenyatta would renege on the promise to back Ruto in 2022. No former president wants a successor with an axe to grind. Ruto has amassed an insurmountable financial lead relative to potential competitors: Besides Raila Odinga, there is no other Kenyan politician with the same level of national appeal and grassroots loyalty to rival Ruto. Mombasa Governor Hassan Joho comes close, but there are structural constraints to his candidacy (he would be a great running mate to Ruto, though). And on top of all this, Ruto has amassed an incredible amount of wealth (or access to it) that will make him the runaway frontrunner in the competition for elite endorsements ahead of 2022. What this means is that Ruto can run in 2022 even without Kenyatta’s support and still win. Running in 2022 as a victim of Central Kenyan perfidy would likely win Ruto sympathy votes: A constant (and potentially powerful) narrative in Kenyan politics is that voters in Central Kenya (Kenyatta’s backyard) never vote for anyone but their own. If Central Kenyan elites were to spurn Ruto, he could go to the wider Kenyan electorate and make the case that he entered into an agreement in 2013 in good faith but got burned — just like Raila Odinga was burned by Mwai Kibaki, and his father before him by Matiba and Kibaki. With such a strategy, Ruto could engineer a coalition similar to Odinga’s 41 vs 1 coalition of 2007 and easily win the presidency. If all else fails, Ruto can blackmail Central Kenyan elites by threatening to destabilize the Rift Valley: This is not a far-fetched idea. It is not a surprise that recent pronouncements challenging Ruto’s 2022 candidacy were met with disquiet in Uasin Gishu and Nakuru counties along the same cleavages that defined the post-election violence in 2007-08. It is common knowledge that the alliance between Kenyatta and Ruto in 2013 was one of political expedience, and did not address the economic and social root causes of the violence that erupted in the Rift Valley following the disputed 2007 election. It would only take a few careless statements from people like Gov. Jackson Mandago of Uasin Gishu to cause significant instability in the Rift Valley. Overall, despite the current impasse over cabinet appointments, Ruto’s political position remains very strong. To weaken him, Kenyatta would have to take overt steps — such as allowing his elite allies to form a different party than Jubilee — which would come with immense political costs (especially in parliament). Kenyatta’s hands are tied on this matter. Furthermore, why would he spend the next five years building a legacy that would be jeopardized by his failure to honor the 2013 deal with Ruto? People often compare Ruto to former President Daniel arap Moi who remained loyal to Jomo Kenyatta and quietly waited in line until Kenyatta died in 1978. I disagree. On the specific matter of succession politics, I like to think of Ruto as a latter day Tom Mboya, the overtly ambitious KANU Secretary General who was murdered ahead of the 1969 General Election after which he would have been in pole position to succeed Kenyatta. Like Mboya, Ruto has, from the beginning, been very clear about what he wants and what he is willing to do to achieve it. And all indications are that this time will be different. From a dictatorship of one, to a dictatorship of 349. I say this is progress. Admittedly, change has been slow. But the dispersal of power is almost always a good thing. Jomo Kenyatta’s regime was corrupt, illiberal and competent. Moi’s was corrupt, illiberal and mediocre. Kibaki’s was corrupt, liberal and competent. So, Moi scores zero out of three. Jomo scores one out of three. Kibaki scores two out of three. Now it adds up! Jubilee’s [Uhuru Kenyatta] stock has fallen not just because it is seen as corrupt, but because it comes across as also illiberal and incompetent. Like Moi’s regime, it scores zero out of three. ….. Which is more harmful to society, mediocrity or corruption? Mediocrity is by definition below average. It stands to reason that all other things equal, mediocrity is more costly than corruption. It goes without saying that a corrupt mediocracy is even more deleterious. When mediocre rulers are also corrupt even their corruption is mediocre. Because they are unable to generate sufficient returns, they eat into the capital. That’s what the decay of our infrastructure during Moi was — they ate the capital. What’s more, what mediocre corrupt leaders steal they squander. Mobutu’s billions have never been traced. That is the ever-insightful Kenyan economist David Ndii writing in the Daily Nation. And of course Kibaki was the best president Kenya ever had. He went to Mang’u High School (along with many other key people in his government). But on a more serious note, can Kenyatta’s administration be redeemed? I think so. Part of the problem has been the total breakdown of constructive communication between the moderate elements in Kenyan society and State House. The ensuing siege mentality at State House has left the president open for capture by the thuggish elements that are rapidly criminalizing the Kenyan state. But progressive Kenyans need not concede the presidency to these corrupt, incompetent and illiberal characters. There is still room for constructive engagement. Unlike Moi President Kenyatta appears to have an instinct to delegate (some say he is clueless at Government). The challenge is how to make sure he delegates to the right people. This happened. Only 31 years ago. Lest we forget. [O]n February [10th] 1984, soldiers of the Kenya Army mounted a security operation around Wajir in Kenya’s North Eastern Province. Having rounded-up all Somali men of the Degodia clan, as many as 5000 were taken to the Wagalla airstrip for interrogation. This was part of the policy of ‘collective punishment’ – a conscious act of state violence against its own citizens. After four days of interrogations at Wagalla, several hundred Degodia lay dead: whether 500 died, or 1000, or more is unknown, but the incident stands as the worst atrocity in Kenya’s modern history. This article recounts what is known about the massacre from witness and survivor testimony, putting this together with documentary evidence recently revealed through the Truth, Justice and Reconciliation Commission (TJRC) and setting the analysis in the wider context of Kenya’s treatment of the peoples of its ‘forgotten north’. The conclusion summarises the findings of Kenya’s TJRC on Wagalla, and comments on the recent construction of a monument to commemorate the massacre, opened at Wajir on 14 February 2014. The following individuals held a top level meeting in the Wajir DC offices on February 8th, two days before the massacre: Joseph Kaguthi (Asst. Secretary, Internal Security), James Mathenge (PS, OP in charge of Internal Security), Gen. J. R. Kibwana (former CGS), John Gituma (PS, Information and Broadcasting), Benson Kaaria (PC, North Eastern), Bethuel Kiplagat (PS Foreign Affairs), and David Mwiraria (PS, Home Affairs). Mwiraria has in the past argued that he and others at the meeting had not idea about what was about to happen. Because of the failure to effectively deal with instances of gross state overreach like the Wagalla Massacre, impunity within the security services continues. Government reactions to insecurity in the northwest, at the coast, in the northeast, in dealing with Mungiki, out west in Mt. Elgon, and even in Eastleigh, are continuations of an old habit that goes back to the Mau Mau concentration camps under the emergency. Throughout the “Shifta” war and well into the 1980s.. Here is the Citizen TV documentary from 2012. 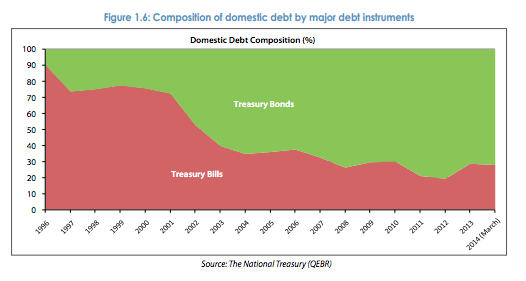 Over the last two decades there has been a remarkable shift in the composition of domestic government debt in Kenya, with long-term debt instruments (bonds) increasingly preferred to short-term debt (T-Bills). The financial market in Nairobi is telling us a thing or two about creditors’ perceived time horizon of the Kenyan government; and Treasury’s capacity for credible commitment. For curious readers, I would argue that the explanation for this structural change (especially after 2003) is more Stasavage than North and Weingast. Why are Kenyan politicians politicizing the military? Botswana, Gabon, Kenya, Malawi, Namibia, South Africa, Swaziland, Tanzania, Zambia and Zimbabwe are the only continental sub-Saharan African states to have never experienced military rule. Each country has managed to do so via well orchestrated coup-proofing strategies of ethnic balancing and material payoffs to the men and women with the guns and tanks. Beyond the ethnic balancing, Kenya has also coup-proofed by keeping the generals wealthy and OUT OF POLITICS – at least not overtly. The generals in Kenya are probably some of the wealthiest on the Continent. I went to high school with the son of an Air Force Major General whose family was always taking foreign trips to exotic places and always made a big splash on visiting days. The only estimates I could find are from the 1960s when nearly “two thirds of the military budget went to pay and allowances, most of it to officers.” A lot of them also got free land for cash crop farming and lucrative business deals (some illegal) from the Kenyatta and Moi governments. Keenly aware of West Africa’s junior officer problem following 1981 Moi extended land grants to junior officers as well. But despite their importance as leaders of a key national institution, most Kenyans, yours truly included, do not know much about the top generals in the army. The one chief of staff that I remember hearing a lot about in my childhood days was Gen. Mahmood Mohamed, the man who played a big role in quelling the 1982 coup attempt. For the most part I only saw these guys in the media on national holidays when they rode on the president’s Land Rover. In other words, I think it is fair to say that, contrary to arguments made by N’Diaye, for the most part the Kenyan military has historically been fairly professionalized and depoliticized relative to other countries in the neighborhood. There is no evidence to suggest that ethnic balancing has severely interfered with the process of professionalization. Kenyan presidents’ preferred agents for dirty political work have always been the intelligence service, the police and paramilitary units, but never (to the best of my knowledge) the military. Indeed the US and British militaries have had very close technical cooperation with the Kenyan military through training, material assistance and more recently joint operations, resulting in a relatively highly trained force that has for the most part stayed clear of politics. But this consensus appears to be slowly eroding. Before the 2013 General Elections the former Prime Minister Raila Odinga accused the military and the intelligence service of colluding with his opponent, Uhuru Kenyatta, to rig the presidential election. And now the heads of the military and intelligence service are reportedly contemplating suing a former aide to Mr. Odinga for defamation. Increasingly, the military is being dragged down to the level of the marionette-esque GSU and Police, perennial hatchet men for whoever occupies State House. Coup proofing is hard. And the thing with coups is that once the genie is out of the box you can’t take it back. Coups just breed more coups. This is why the generals must be left fat and happy and in the barracks, or busy keeping the peace (and hopefully not facilitating charcoal exports) in Somalia’s Jubaland State. Do your ethnic balancing and all, but by all means KEEP THEM OUT OF POLITICS (I am glad the current Defense Minister has no political constituency). The last thing Kenya needs is a Zimbabwe situation in which there is open bad blood between the military and the opposition. Plus Kenya, based on its per capita income, ethnic politics, and minimal experience with genuine democratic government, is still not beyond the coup trap to be able to safely play politics with the military. If you doubt me, go find out the last time Brazil, Thailand and Turkey had generals in charge. Former Defense Minister and GEMA leader Njenga Karume is dead at 83. Mr. Karume succumbed after a long battle with cancer. The late Karume, who made most of his money from the beer distribution business, was one of the most influential and richest politicians among the “independence generation.” Njenga Karume was mostly a self-made man (His autobiography is titled “Beyond Expectations – From Charcoal to Gold”). With little formal education (many Kenyans know of his “wananinji” pronouncements), he managed to create a business empire that catapulted him to the boards of many a Kenyan company. Being the leader of the powerful GEMA cultural bloc and a close ally of President Kenyatta certainly also helped. The passing of Njenga Karume comes just four days after another veteran politician and also close friend to President Kibaki, John Michuki, passed away. It is hard not to think that time is beginning to catch up with the political elites who led Kenya’s independence generation. Indeed this year’s general election will be the first without a leading independence leader in contention for the presidency (Theirs sons and political scions will duke it out). The natural generational change is certainly a cause for excitement; peaceful elite rotation mostly leads to positive outcomes. But at the same time I have the nagging feeling that the 50 and 60 year old “young turks” who are about to take over may lack the encompassing interest that the “wazees” shared (Notice how nice Kibaki has been to former President Moi). Yes, they were not always good people – the deaths J. M. Kariuki and Tom Mboya forever remains a blotch on their record – but you have to give it to them for holding it together even when things were falling apart all around the neighborhood. These are interesting times in Kenya. The Deputy Chief Justice and Vice President of the Supreme Court, Nancy Baraza, stands to lose her job for harassing a female security guard on New Year’s Eve. Ms Baraza’s ordeal is interesting because it captures the momentous changes taking place in Kenya’s institutions of governance. The idea that a public official of such high stature could get in trouble for the “simple act” of threatening a security guard was laughable only a few years ago. Not long ago Kenya was divided between wananchi (loosely translates to citizens) and wenyenchi (owners of the country), the latter being virtually above the law. That has since changed. Even the president has in the recent past been forced to reconsider his actions whenever they were deemed to be in contravention of the supreme law of the land. But the progression towards this state of affairs has not been straightforward – which is why I think that the Kenyan case is a good lesson in contemporary evolution of limited government. Academic discussions of limited government revolve around the question of how to achieve credible commitment among the veto players within a polity. That is, how competing factions within the state can agree to a modus operandi that makes their interactions predictable and objectively justifiable based on a predefined idea of what actions are legitimate. The most common way to do this is usually to have institutions of state defined in constitutions and to regularly elect public officials. But as Stasavage has argued, the mere existence of institutions and veto players is not a sufficient condition for credible commitment. There must be a guarantee that specific important veto players will have de facto veto power. In other words, it matters that various factions within society CAN balance each other. How does this map onto the Kenyan case? The fact that both Odinga and Kibaki have had public fall-outs with wealthy co-ethnics who have then decamped to the other side is illustrative of this fact. It is this emergence of “independent wealth” that provided the foundation of the strong opposition that emerged after Moi retired. Led by Raila Odinga and his allies, these politicians had the money and social capital to challenge the president and his men on equal terms. That is why when stuff hit the fan in 2007-08 Kibaki had no option but to agree to share some of his power with Odinga. The two men knew that neither of them could win the game of “my street against your street.” It is also why the negotiated settlement that is Kenya’s new constitution was an exercise in give and take, with an absurd emphasis on procedure and self-executing clauses. The implementation of the new constitution has not been any different. Which takes us back to Ms Nancy Baraza. It is common knowledge that Ms Baraza was not an establishment appointment to the Supreme Court. She was part of the civil society coup in judicial appointments which also included the Chief Justice. Having “lost the court” the establishment ensured it had control by insisting on maintaining control over the Director of Public Prosecutions and the Attorney General. The establishment also controls the Police Force. Their challengers (who are no angels themselves) had the goodwill of civil society and big enough constituencies in key organs of the state – including the military. They also had a plurality in parliament. So when Baraza got in trouble due to what appears to be a lapse in judgment, the establishment saw a chance to get her out. But they had to do it within the bounds of due process. And so they have been quick at it. The police (whose top brass will be fired soon by a panel laden with civil society types) conducted a quick investigation and concluded that the DCJ had a case to answer. The Judicial Service Commission has since arrived at the same conclusion, and recommended the Justice’s suspension to the president. The process has thus far been transparent, with very few questioning the legitimacy of the inquiry into the behavior of Ms Baraza. Meanwhile the civil society has been dead quiet. Many fear that their hard fought gains of having two of their own (The Chief Justice and his deputy) in the Supreme Court will be eroded after Ms Baraza’s departure. I bet that when the dust settles and the debate over who should replace Baraza gets heated civil society (and the Odinga camp) will want to replace her with one of their own. It will be interesting to see if the establishment will move to alter the balance of power by challenging this implied consensus. The long and short of it all is that it matters that competing forces in society credibly balance each other. In those countries (like in most of Sub-Saharan Africa) where presidents and their men have overwhelming power advantages over their opponents, it will be doubly hard for limited government to come about. If the Kenyan experiment succeeds it will be proof that you need not have an inter-ethnic love-fest or the lack of factions for limited government to emerge. This is mostly a story about the Kenyan political and economic elites. What about the wananchi/masses? That will be the subject of a future post. Happy Jamuhuri Day to all the Wananchi out there! Kenya is 48, with a lot to celebrate. Happy Jamuhuri Day! I remember as a kid watching TV and seeing a woman who was the head of the greenbelt movement being chased around by armed policemen. All I knew was that she was fighting to protect Karura forest and freedom corner in Nairobi from land grabbers. This woman was Wangari Maathai, the first woman in eastern Africa to receive a PhD. She would go on to win the Nobel Peace Prize and do all Kenyans proud. For many Kenyans Prof. Maathai was the face of activism against environmental degradation and misuse of natural resources. Her organization, the Greenbelt Movement has planted more than 20 million trees across Africa. She will be forever remembered as a key part of Kenya’s Second Liberation. Former president Moi infamously liked warning voters that siasa mbaya maisha mbaya (bad politics leads to a bad life). This was code for vote for the opposition and no roads, no schools and no hospitals for you. It will be interesting to see how the Kenyan presidency evolves following this revolutionary clipping of its powers. Already the executive has seen its powers watered down by an increasingly powerful parliament. To reinforce this trend, the judiciary has just seen the appointment of a card carrying reformer as Chief Justice. A powerful judiciary will provide a check not only on the presidency but on the wider executive branch as well – especially the now independent and obscenely corrupt Kenyan ministries. Credit for the relatively more limited presidency also goes to President Kibaki. Many forget that for a long period of time Kibaki governed with Moi’s constitutional powers. It is a relief that the limited presidency will now be both de facto and de jure, especially because there are way more Mois than Kibakis vying for the presidency in 2012. A word of caution, though. Institutions are not automatic fixes to problems of governance. They are like incomplete contracts that have to be reinforced by numerous conventions and “gentleman agreements.” The Kenyan political elite may yet find ways to circumvent the spirit of the new constitution. The survey undertaken by the National Cohesion and Integration Commission (NCIC) gave shocking details of how political patronage and personality-based leadership had reduced the civil service into an exclusive club of the big communities at the expense of the so called small communities. According to the survey, members of the Kikuyu, Kalenjin, Luhya, Kamba and Luo communities occupy 70 per cent of all jobs in the civil service. 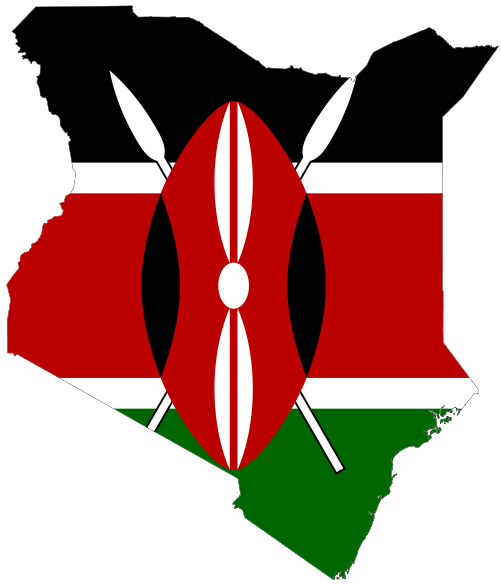 Keep in mind that Kenya has about 42 ethnic groups. I personally did not find this very shocking. The report indicates that the two ethnic groups that have occupied the Kenyan presidency since independence, the Kikuyu and Kalenjin, together make up 40% of the civil service. My hope is that this report will initiate debate over merit in public employment. It is about time we had standardized and transparent ways of hiring public servants and not leave all the discretion in the hands of venal pols. kenya: a model of conservative revolution? An ambitious project is in the works to build a new city from scratch in Kenya, a sign that things are indeed changing in the economic engine of the wider eastern African region. The stock market voted for the new constitution with a bullish run on the eve of the ratification of the document. Investments in property – the property class has outdone most asset classes in the last two years – serve as a sure marker that Kenyans are confident in government’s commitment to protection of property rights. I am one of those who remain optimistic that Kenya is on the verge of take-off. And here is why. Not long ago the idea of a cabinet minister resigning in Kenya was a pipe dream. Even more improbable was the idea of parliament defying the president. But these days ministers resign and the Kenyan parliament routinely defies State House. More importantly, the august house has continued its march towards independence from the executive – both functionally and financially. By controlling their own budget and calendar and building a functioning committee system, members of The House have acquired enough muscle to expose lapses in the management of public affairs – including the present scandals involving the Kenyan foreign ministry and the Nairobi City Council. The biggest question, however, is whether the reforms embodied in the new constitution will last. My answer is yes they will, for two reasons. Firstly, the reforms are not as radical as some commentators think they are. The Kenyan establishment still stands to gain the most from the institutional reforms embodied in the new constitution. Land ownership, taxation, regulation of business, among other topics of interest to the elite are still firmly in the hands of the conservative centre and their provincial allies. Secondly, the emerging culture of bargaining, as opposed to Nyayo era “wapende wasipende (like or not) politics,” provides opportunities for amicable settlement of disputes resulting in self-reinforcing deals. No single political grouping can force its will on Kenyans. Mr. Kenyatta needed to only convince the Kiambu mafia for his policies to fly. Moi only needed a small group of collaborators. The new dispensation, however, requires that a significant number of elites, with varied political interests, buy into an idea before it can fly. This is progress. It is stable and sustainable progress. Kenya’s dark hour in early 2008 was an eye-opener to the political and economic elite. The more than 1300 deaths will forever be a reminder of the evils of strongman rule. The broader legacy of the 2007 election will however be positive. The elections showed the core conservative establishment that they cannot run the country on their own, and that the peripheral elites also have significant de facto political power. By forcing the elite into agreeing to a self-enforcing arrangement, the regrettable events of 2007-08 facilitated elite compromises culminating in their new Kenyan constitution. The yet to be established supreme court will provide the final piece of the foundation needed for sustained institutional development in a predictable environment. Paradoxically, the biggest plus of Kenya’s new constitution is its conservative bent. And for that reason it will endure beyond the current teething phase. A more radical document would have been eviscerated just as the Kenyatta and Mboya amendments decimated Kenya’s independence constitution. Given the stature of Mr. Ruto as the ethnic chief de facto political leader of the vast Rift Valley Province, this is a big deal. The next big test for how committed the ruling class in Kenya is committed to the Rule of Law will be when Ocampo and the ICC come calling with arrest warrants later in the year or early next year. Bigwigs in cabinet and close confidants of both the president and his prime minister are expected to be among those indicted.